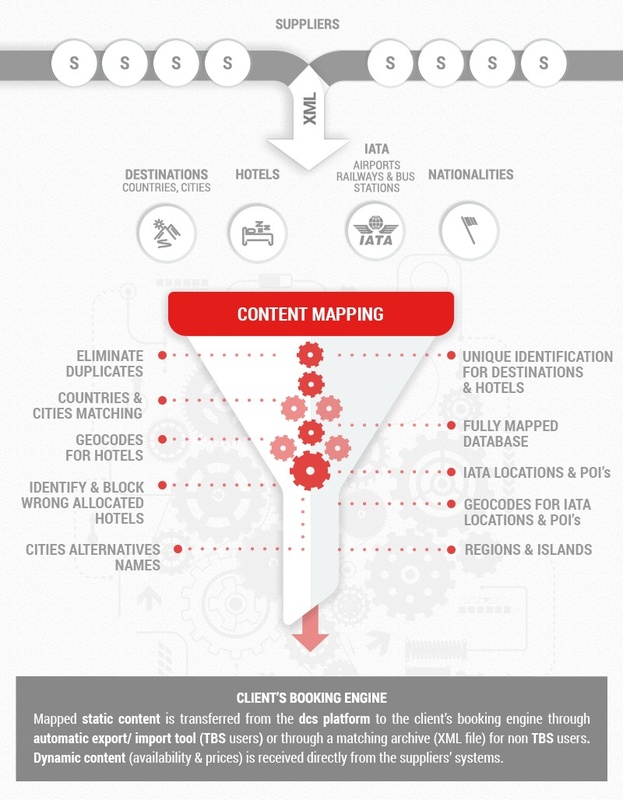 Content Mapping service allows you to enjoy the content from the most important worldwide suppliers through a complete and integrated database with unique identification for destinations and hotels. Having the database fully and accurately mapped means you can offer your customers the newest content and the best deals available on the market. A database that is not accurately cleaned and continuously mapped, might cause you to miss the latest additions provided by your suppliers, book wrongly allocated hotels and increase your engine’s response time. We gather the static content from multiple suppliers and automatically upload it (via XML) into our platform. Destinations mapping refers to joining into a single record, with a unique ID a city that exists in one or more supplier systems. When performing the destinations mapping process, we take into account each country’s specific territorial segmentation (provinces, regions, states etc.) and spelling alternatives. Besides cities mapping, we perform countries and nationalities mapping as well. Hotels mapping refers to joining into a single record, with a unique ID a hotel that exists in one or more supplier systems. When performing the mapping, we identify, track and block the wrongly allocated hotels (hotels allocated by the suppliers in different cities than the ones they are actually located in). Transferring the mapped database to the client’s booking engine is done automatically for IRIX clients, through an export/ import tool that we developed; the process is supervised by the dcs team. This way, you can start enjoying the mapping service in no time. For non-IRIX clients we can export the mapping archive in no time; it includes XML files for each mapping category (countries, cities, hotels, nationalities, locations, blocked hotels and city alternative names); the only thing that the client needs to do is to upload the mapping archive in his own platform. Our mapping service includes maintenance of the database as well, by performing regular updates and improvements. This means that all new destinations and hotels that appear in the suppliers‘ systems as well as the latest changes, will be available in our platform. These new elements will be either merged to existing IDs or assigned to new IDs. Using the Content mapping service, the client will be able to search among unique results from multiple suppliers, sort these results by price, star category etc. and easily find the best available price offer in its’s own selling interface (B2B or B2C). dcs plus BPO is the result of the 14 years experience and expertise of dcs plus in the travel industry, created to improve the business processes of travel agencies and tour operators, and to add value to the travel technology.